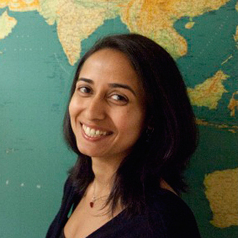 Priya has an undergraduate degree in Computer Engineering from University of Mumbai and M.S. in Bioinformatics from George Washington University. She received her Ph.D. (2013) in Genetics from Harvard University (advised by David Reich and Nick Patterson). During her dissertation, she developed novel methods and approaches for analyzing genomic data to learn about population history, particularly focusing on populations of mixed ancestry such as West Eurasians and South Asians. For her postdoc, Priya has been investigating mutation and recombination processes in primates and their use as molecular clocks.